Metal Gods is a 72 page sourcebook dedicated to incorporating robots, androids, and other forms of artificially intelligent life into campaigns on the Twisted Earth. 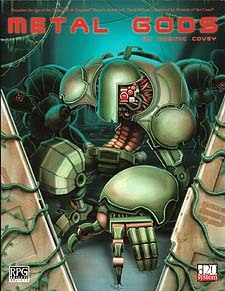 History of the "Metal Gods"- Metal Gods looks at the evolution of robotics in the alternative history of Darwin's World. Android Characters - A flavourful system for creating android characters, including 33 android-specific feats and three new prestige classes for androids (and one for their orgainc "servitors"): the assassin android, android mastermind, child of the metal gods, and Foundationist android. Robotic Life - Metal Gods defines the various levels of artificial intelligence, gives rules for playing "wild" or "berserk" robots, and has game statistics for 18 different androids, robots, and programmed automatons from before the Fall. Metal Gods also introduces a new template, the cyborg. Robot Items - A short sampling of some high-technology items that are often found in the possession of the so-called Metal Gods as well as items used against androids during the last days of the Fall. Adventure Material - Adventure material for game masters, including several adventure hooks for low, mid, and high level campaigns as well as a fully detailed mini-adventure. Darwin's World - is a post-apocalyptic role-playing game set in the wild inhospitable world of mankind's ruin, decades after a series of devastating wars that brought the human race to the brink of extinction. In a world where raditation altered the very course of nature, mankind ceased to exist in its current form. Mutations and genetic variations are the edge separating a species from life and death.